Vamsi received a B.S. in mathematical and computational science at Stanford University and an M.D. from the Harvard-MIT Division of Health Sciences and Technology. He then completed his residency in internal medicine at Brigham and Women’s Hospital and postdoctoral training at Whitehead Institute. 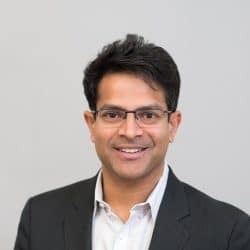 Vamsi now directs a laboratory at Massachusetts General Hospital, and is an Investigator of the Howard Hughes Medical Institute. Vamsi has received numerous awards including a MacArthur Prize and election to the National Academy of Sciences. What are all of the components of mitochondria, and how do they operate within cellular networks? Which of these mitochondrial networks are altered in rare or common human diseases? How can we develop strategies with which to alleviate mitochondrial dysfunction? Computational and experimental genomic strategies to define the function of all mitochondrial proteins. We built a comprehensive catalog of mitochondrial proteins (A) and developed genomic algorithms to predict function of unstudied genes using shared evolutionary history (www.gene-clime.org) (B) and shared co-expression across many conditions (www.gene-clic.org) (C). Identify genes and pathways that are altered in rare human diseases. We have combined the MitoCarta protein inventory with human genetics and sequencing to discover over one dozen novel genes underlying Mendelian mitochondrial diseases. Discover biomarkers and therapeutic targets for mitochondrial disease. A genome-wide CRISPR screen for genes that survive a mitochondrial toxin highlighted the endogenous hypoxia response as a potential therapeutic for mitochondrial disease (A). Mice engineered with a genetic mitochondrial disease (Ndufs4-/-) that were raised in low oxygen conditions show strikingly increased lifespan (B) and weight (C) compared to mice in normal oxygen conditions (blue vs red curves). These murine studies support the possibility of hypoxia as a potential therapeutic for mitochondrial disease.